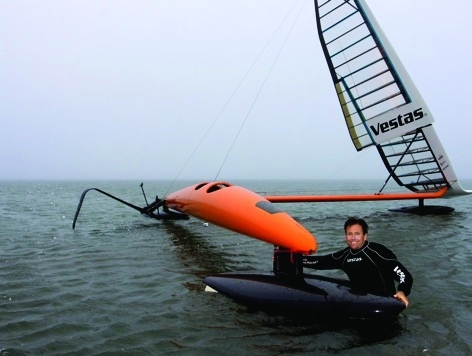 The Vestas SailRocket II is aiming to take speed sailing to a new level with a radical design that incorporates elements from glider aircraft. There’s a growing sense of excitement and attention building up around the ‘Bloodhound’ team’s plan to send a car past 1,000mph (1,609km/h). But they aren’t the only group of British engineers tilting at a coveted speed record and seeking to push the boundaries of physics. 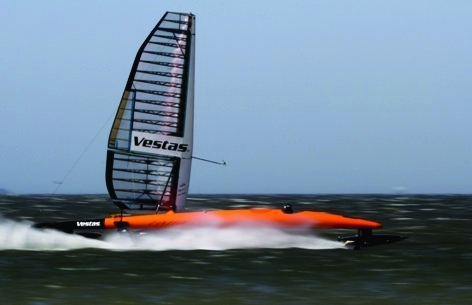 But while Bloodhound will use some of the most eye-watering propulsion systems ever put together, the Vestas SailRocket II relies on the wind alone. That said, just as Bloodhound is blurring the boundaries between car and missile, VSRII in many ways more closely resembles a glider than a boat — complete with a fuselage, wing and foils. Indeed, in 2008 the first VSR took the World Sailing Speed Record Council (WSSRC) B Class (boats up to 21.84m²) crown at a speed of 47.36 knots (54.5mph, 87.71km/h) shortly before launching itself nearly 10m in the air and almost doing a full loop-de-loop. With the next version, the team is aiming to break the outright unpowered 500m record currently held by US kitesurfer Robert Douglas at 55.65 knots. 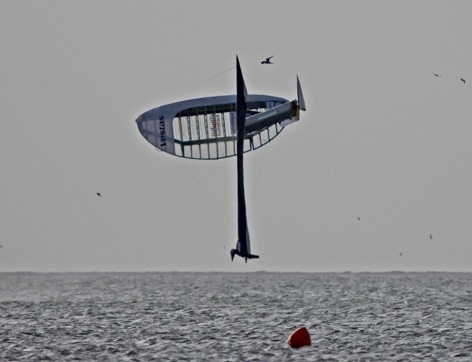 But it is less interested in incrementally nudging up records and believes it can push the boundaries with what has been referred to as the speed-sailing ‘sound barrier’ at around 60 knots. ‘It’s still the same concept — this balanced, self-stabilising wing and foil combination — but we looked more rigorously at the aerodynamic stability, because inevitably you end up with most of the boat in the air, so we analysed that the same way you would do with an aircraft,’ said Malcolm Barnsley, senior test engineer at Vestas Technology R&D. 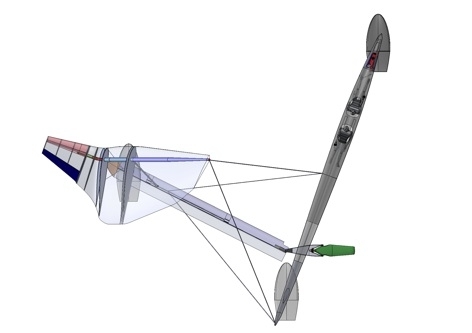 The VSRII has three main hydrofoils, which are the only parts of the boat in contact with the water surface: two on each end of the fuselage and one under the wing, which is itself attached to the fuselage by a beam element (see top view picture). Importantly, the main fuselage — which has space for two passengers — is angled at 20° to the direction of travel so that the boat points directly into the ‘apparent’ wind to reduce drag and increase stability at high speed. ‘The wind sees a very small object and a very streamlined object, which of course cuts down on drag,’ Barnsley said. The VSRII is specifically designed for runs at Walvis Bay on Namibia’s west coast and, because the boat only needs to sail in one direction, the wing is asymmetrical and set up for a starboard tack. One of the most challenging and arguably most crucial aspects of the boat is the foils, which are key to achieving high speeds while countering the side force of the wind and stopping the boat from slipping sideways. However, when travelling through the water at speeds upwards of 50 knots, all foils experience a phenomenon called cavitation, where the water is subjected to rapid changes in pressure that effectively cause it to vaporise at room temperature, creating cavities. These cavities cause drag and instability, and can even erode away the hardest materials due to the resulting tiny bubbles collapsing with huge force. The same problem occurs on the propellers of high-speed power boats, which employ design features that encourage ventilation to mitigate the cavitation. However, the same approach has never been attempted in sailing. ‘They’re not performing the same duty; they’re not inclined to the surface in the way that ours is, so we have a unique situation in applying these types of foils,’ Barnsley said. Unlike the teardrop shape of almost all other foils, the new design uses ventilated foils shaped more like sharp wedges. Air is forced to come down from the surface to ventilate the foil, meaning that only one side is used to grip the water, removing the low-pressure part of the flow from the foil surface and, in theory, negating cavitation. After officially launching in April from its base in East Cowes on the Isle of Wight, VSRII was promptly shipped to Namibia where initial trials were carried out. These concluded on 14 December with some mixed results. They achieved impressive peak speeds of 50+ knots with no sign whatsoever of the instability of VSRI — but the outright unpowered record remained elusive, as did stratospheric dreams of 60+ knots. The team believed that its foils were essentially too large to allow full ventilation to occur before cavitation set in, consequently meaning that the boat ’just digs itself a hole and falls into it’, as pilot Paul Larson put it. ‘We’ve been too conservative, not forcing it to go into the new zone quickly enough, in this other phase of flow. You just need a certain level of efficiency from your foil to extend into that speed range and then the performance is guaranteed,’ Barnsley said. The team has already chewed over recent events in Namibia and has a concept design for a new set of foils that Barnsley says they have ‘absolute confidence in’. Provided additional funding is forthcoming, the team hopes to do further trials at Walvis Bay in March 2012 and, if it is seeing suitably high speeds, it will call in timekeepers from the WSSRC.